Can a king save his kingdom, when his own survival seems unlikely? War has come to Carthya. It knocks at every door and window in the land. And when Jaron learns that King Vargan of Avenia has kidnapped Imogen in a plot to bring Carthya to its knees, Jaron knows it is up to him to embark on a daring rescue mission. But everything that can go wrong does. His friends are flung far and wide across Carthya and its neighbouring lands. In a last-ditch effort to stave off what looks to be a devastating loss for the kingdom, Jaron undertakes what may be his last journey to save everything and everyone he loves. But even with his lightning-quick wit, Jaron cannot forestall the terrible danger that descends on him and his country. Along the way, will he lose what matters most? And in the end, who will sit on Carthya's throne? I kind of don't know what happened to me. I just didn't enjoy this one as much as the previous installments. Although Jaron was still the same witty, lucky and sly character that he was when I was first introduced to this trilogy, something just felt off about this book... 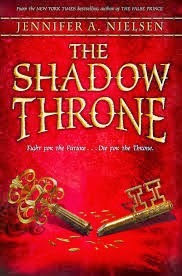 I think I went into The Shadow Throne with too many expectations. After all, The Runaway King had been in my top 13 favorite books of 2013 list. We're thrown immediately into the thick of things when this story starts. That's one of the aspects that I love about this series, there's never really a down moment. Even when characters are debating or angsting, they're still seemingly in motion. That being said, there were still a few moments that slowed everything down a wee bit too much. But those were rare. Jaron didn't change for me. His character stayed the same, and my level of love for did too. The other characters in the story needed to up their ante, however. Roden was not as prominent as he was initially in the storyline of the books, and I kind of missed him, along with Tobias. Princess Amarinda somehow managed to get on my nerves in this book when I'd previously been fine with her character. I'm not even sure I can give a reason as to why I felt this way. Maybe it was because she made decisions and all I wanted to do was yell at her for it? And I can't even talk about Immogen. Darn you, Immogen! The plot of this book seemed to jump a lot more than the first two books. We'd be in Avenia one second and then Carthya the next. I thought that it usually took weeks for people to travel from country to country on horseback, instead of mere hours? But what do I know? Also, Jaron's actions just felt a little too lucky at times. He was supposed to be injured during a lot of the book, but man, he could still move like he was professional fighter, runner and horseback rider, combined. All in all, this book did frustrate me. I was expecting more and, unfortunately, I didn't get it. Does that mean that I'm going to stop recommending these books to people? Heck no! The False Prince will always have a place in my heart. *Note: I received a copy of this book to review from Netgalley. This in no way altered my opinion/review. Entangled February Novellas Are Here!